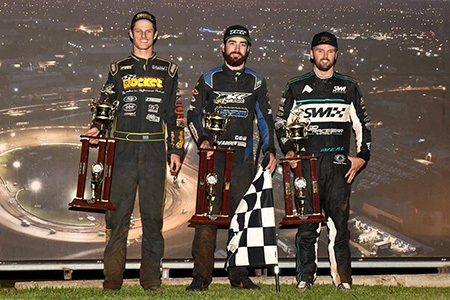 James McFadden, Matt Smith and David Doherty were big winner on "Old School Night" at Valvoline Raceway in the Ultimate Sprintcar, Speedcar and Late Model classes respectively last night. James McFadden borrowed his mate Jack Lee's #25 Lee Contracting Ultimate Sprintcar and rewarded him with a win in the 30-lap A-Main on Old School Night at Valvoline Raceway. David Doherty rocks the "Roof off rumble" at Valvoline Raceway and takes the win from Robbie Farr in second place on debut ahead of Ben Nicastri in third. A Nailbiting finish in the Bob Tattersall "Two-gun 25-lapper" for Speedcars with Matt Smith edging out Matt Jackson by less than a second to take the thrilling victory. McFadden became the second Warrnambool domiciled main event winner in as many USC rounds to take victory at VR as he beat home early leader Sam Walsh in second place and opening round USC NSW winner Jamie Veal home third. Due to uncooperative weather it had been almost four weeks since a USC main event had been conducted at Valvoline Raceway. Tonight's racing was conducted under crystal clear skies on a night where qualifying was traded for dual heats and an 'old school' step back in time. Matt Dumesny led the A-Main initially after scoring pole in the Shootout but then it was Sam Walsh who took charge on a second lap restart and sped away with the advantage whilst Veal began to make rapid progress after starting from 7th position on the grid. Walsh's Rocket Industries #92 jumped the cushion one too many times however throughout the race allowing McFadden to shoot through on the inside and hold the number one spot. Walsh and McFadden duelled for several laps and it looked like the final result would go right down to the wire. Veal would later explain that he had simply started too far back in the starting grid to make more of an impact. McFadden was too smooth to be re-challenged even though Walsh had a serious crack in the dying laps and scored his first win since the Australian Sprintcar Championship preliminary night in 2017. "It was good fun tonight, I really enjoyed running the cushion, it was a bit treacherous but it's why I love driving Sprintcars too. It's also really cool to win here on Craft Brothers night because Richard and Peter are great family friends and they're special people to us." The next round of the Ultimate Sprintcar Championship NSW will be on Saturday, November 10 and is the Hi-Tec Oils Ultimate Speedway Challenge with Sprintcars, Speedcars and Late Models.